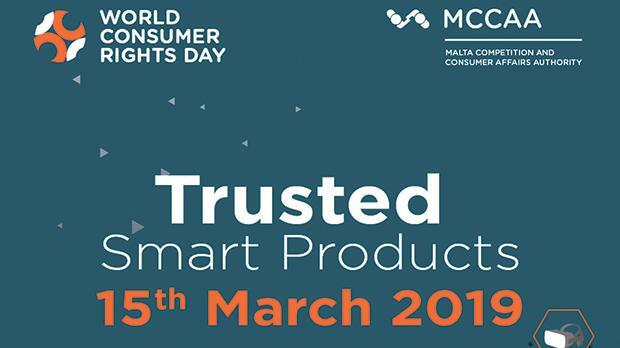 On the occasion of World Consumer Rights Day, which is internationally celebrated on March 15, the Office for Consumer Affairs at the Malta Competition and Consumer Affairs Authority will or­ganise a half-day conference on the theme ‘Trusted smart products’. The main objective of the conference is to discuss how smart technology is changing the nature of products and services consumers use and how these new products are affecting their lives. Worldwide there are 23.1 billion connected devices and these are expected to triple in five years’ time. Consumers need to be aware of the opportunities and threats of connected technology or they will be vulnerable to security and privacy attacks. The conference, which will take place on March 15 between 9am and 1pm at The Palace hotel, Sliema, will assess the role of consumers as users of smart products and how they are legally safeguarded when something goes wrong with the device. Who is responsible and what type of remedy can consumers claim? Another important theme is users’ privacy and data protection. Consumers need to be aware that by connecting any physical device to the internet there is always some degree of digital security risk, and where personal data is involved, to potential privacy challenges. Hacking risks are another common issue with smart products. Consumers need to be well in­formed about the precautions they should take to avoid such risks and should also know what to do when their devices are hacked. Cybercrime and how to avoid falling victim to cyber criminals will also be discussed during the conference. The conference will be ad­dress­ed by Parliamentary Secretary for Consumer Rights, Public Cleansing and Support for the Capital City, Deo Debattista. There will also be speakers from the European Commission’s Directorate General for Justice and Consumers, the University of Malta, experts on consumer affairs, the Information and Data Protection Commissioner, the Malta Chamber of SMEs (GRTU) and the Cybercrime Unit. Attendance to the conference is free of charge. Registration can be done online by visiting the MCCAA’s website at www.mccaa.org.mt or by calling 2395 2000.